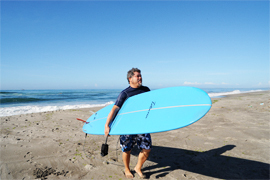 I am currently shooting Tatsuro Ota, the owner of the surf and Hawaiian goods shop in Shizuoka. He is Deaf, the same as me. A lot of tanned surfers are coming to his shop. 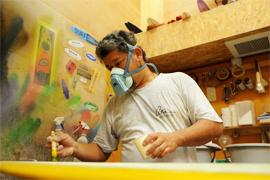 When I went to his shop for the first time, I was watching how he and hearing surfers communicated with each other. I was so surprised because the way they communicated was new to me. Through the use of gestures and by writing on paper, they tried so hard to tell to each other their messages. It is just like the communication that occurs between Japanese who cannot speak English and Americans who do not know Japanese. Then, I decided to make this movie. It doesn’t matter how people communicate. We don’t have to stick to vocal communication or sign language. It is wonderful that we are eager to tell someone about ourselves and that we have someone to talk to. between him and his customers. *“Deaf” refers to people who cannot hear and who use sign language. They are proud of being Deaf. Hearing impaired is a medical term that expresses the idea that the impairment has to be fixed to get the hearing to be as normal as it can be. We use the term “Deaf” in this movie. That was my dream when I was in elementary school. When I was a child, there was no captioning on TV programs, so I couldn’t enjoy watching it with my family. One time my father saw me looking sad, so he rented a foreign movie with captioning from the video rental shop. I was deeply touched by the story of friendship between an alien and a boy. Since then, I have had a dream of making a film which gives energy and courage to a lot of people. When I was 19 years old, I flew to the USA and studied the technique of film making. Now I am making documentary movies about deaf people. I have met more than 150 people since I started. I would like to tell their dreams and wishes to as many people as I can. And, I would like to help build a society where everyone lives together however he or she is. 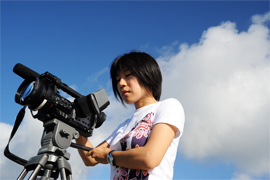 Studied: the Film Industry, American Sign Language and Deaf Culture at California State University, Northridge while attending Aichi University. Presently: teaching Sign Language in Nagoya Gakuin University and Aichi Gakuin University. 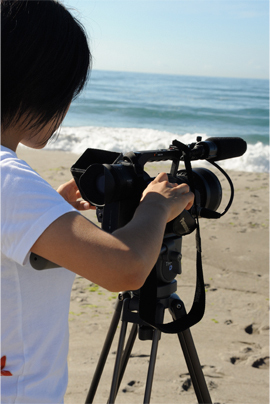 At the same time, making documentary movies and going not only in Japan, also flying to USA, Canada and Korea for shooting. Currently showing her movies and giving lectures in all over Japan. “I want to have a surf shop.” When he was seventeen, this dream came to his mind. While he was walking around downtown Kyoto, he found a small surf shop. He thought that all of those surf boards in the shop were so cool. At the same time, his dream became to be the owner of a surf shop. During his college years, he learned how to surf from a friend and he got into it. After he graduated from college, he started to work at a local company. However, he still had the dream to be a surf shop owner ever since high school, so he visited a lot of surf shops all over Japan in order to learn how to shape the boards. None of those shops accepted him though, because of his deafness. It took about twenty years for Ota to finally find a man who gave him the opportunity to work and learn. 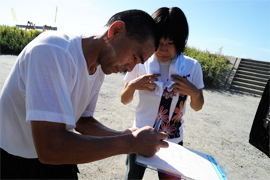 That man is a pioneer of Japanese surfing named Masanori Komuro, a pro-surfer, who owns a surf shop in Kanagawa. Ota decided to move there and learn about board shaping so he resigned from the company where he worked for twenty years. This was the spring when he was 41 years old. 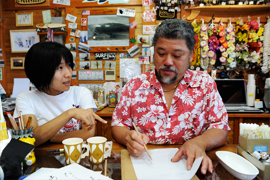 For two years, Ota had learned how to make boards and how to manage a shop from Mr. Komuro. 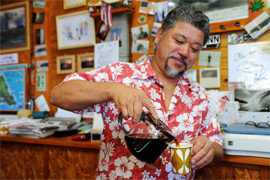 In 2005, he stayed in Hawaii for six months to learn about board shaping and Hawaiian culture. 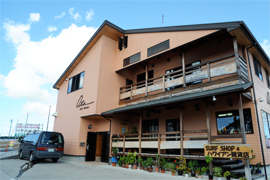 On April 21, 2007, he opened his shop in Kosai, Shizuoka. For the first couple years, he only has a few customers. Even though the shop was opened all day, every day, there was a day when nobody came. He was anxiously thinking of how to get hearing customers. 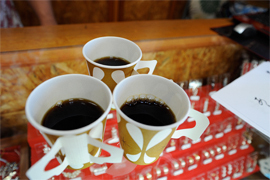 So he started to give out cups of Hawaiian coffee. That’s how he and those surfers started a conversation through writing. 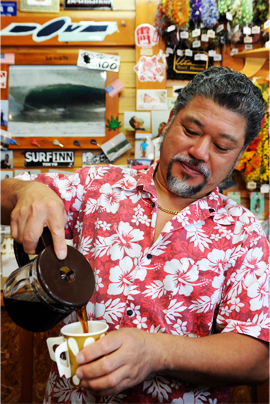 His smile and coffee catch the customers’ hearts, and his regular customers are increasing. One of the customers said his smile was the best in Japan. Because of his warm character and the idea of serving coffee, his shop is crowded with a lot of people now. It has been about twenty years since then. As soon as I graduated from college, I moved back to Japan in order to learn JSL. 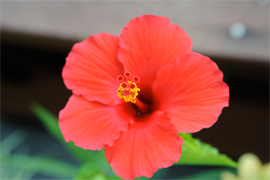 Although I am hearing, I sign with rich facial expressions and large body movements. I have known Ayako for 15 years. Since then, I am a person who always watches her work. When I was listening to her talk about this large scale movie “Coffee and Pencil”, I couldn’t stop thinking of joining it because of her enthusiasm and Tatsuro’s character. I therefore ran for producer. Even though this is the first time for me to be a film producer, I have put all my energy and a sense of wildness to make this movie.